The Small Castle is a great castle to rent when the budget is tight and space is limited. 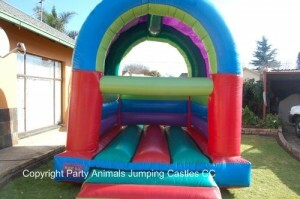 With all the extras one has come to expect from Party Animals and yet still affordable. The roof provides welcome shelter against wind, rain and sun. The castle is nice and cozy in winter. Johannesburg Franchise has three Small Castles in different colours. The motor is a .75kw motor with a 15m extension lead. If the power point is further than 15m from where the castle will be placed, you will need to supply an additional extension lead. These are not provided by Party Animals.